I got my hands on this Hello Kitty CD Karaoke System the other day and was pleasantly surprised with what I found. I bought it as a present for my niece, but couldn’t resist giving it a test-drive before handing it over. As far as kid’s karaoke machines go, the Hello Kitty karaoke system does a bang-up job. The whole unit is self-contained – it has a built in screen, built in speakers, an attached and corded microphone, and built-in audio controls. I think kid’s karaoke units pretty much need to be “all in one” lest parts get lost or broken, so the Hello Kitty system is on the right track from the get go. As a bonus, you can even buy a second microphone to hook up to the karaoke machine for duets and more. This is absolutely perfect if you have multiple kids, as it’s basically built-in sharing. Even more awesome, the karaoke system comes with a built-in dock that you can use to connect your iPod, mp3 players, and more directly to the machine. You can then play your favorite songs through the Hello Kitty system, directly off of your device! The Hello Kitty machine also comes with several cool vocal effects, like balance and echo control, so your kids can have even more fun messing around with their voices while singing (I know I did, and I’m a 37 year old man!). To top it all off, the karaoke machine features a delightfully pink color scheme, complete with Hello Kitty decals front and center. If you have a little girl (or boy!) 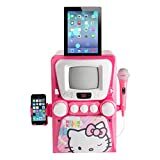 who loves pink and hello kitty, you’d be hard pressed to come up with a more perfect karaoke machine! This unit has just about every kid-friendly feature you could ask for in a karaoke machine. It comes with a built-in, 5 inch black and white screen for reading lyrics, built-in speakers for audio, support for two microphones at once (each with their own audio control!) so you can sing duets, and is battery operated for maximum portability. It also includes a built-in dock where you can directly connect your iPod, mp3 player, etc, so you can player whatever songs you want through the karaoke machine. It does come with a front-loading CD/CD-G player as well, so you can play all of your favorite CDs. It’s worth noting that if you want lyrics to appear on the screen, this will only work with CD-G format discs – the G stands for Graphics and means that there are associated lyrics, images, etc on the disc alongside the audio. Your best bet with these discs is to stick with CDs that are specifically labeled as karaoke CDs. The karaoke machine also boasts an internal, 20-track programmable memory so you’ll always have something to sing along with, even if you leave your iPod and CDs at home. The unit is powered by 8 C batteries, but also ships with an AC adapter so you can save on battery costs whenever you’re able to plug the machine into a wall outlet. The Hello Kitty Karaoke machine is extremely portable, in my opinion. It measures in at 11 x 13 x 16.5 inches, and weighs under 10 pounds. It’s honestly the perfect size for kids to carry around with them, wherever they might want to take it. Like I said, the unit is powered by 8 C batteries, which do contribute to it being a little bit heavier. But, they also make it more portable than a unit requiring a dedicated power source. Again, the Hello Kitty machine does also ship with an AC power adapter that you can plug directly into a normal socket if you wish to do so! This is a bit of a toss-up. Personally, the unit I received was perfect right out of the box, well-built, and definitely as durable as a kids karaoke machine should be. However, if you poke around other customer reviews a bit, it seems like there may be a bit of a quality control issue with the manufacturer. Some units seem to arrive partially broken or with faulty functionality. The manufacturer does seem to have a 30 day warranty in place though, so you can always send it right back if you get an issue-prone model. Otherwise, the plastic is thick and well-constructed, as are the screen and the controls. The microphone definitely feels a little cheap at times, but I wasn’t expecting much on the front to begin with. This is where many kid’s karaoke machines really lack. Surprisingly, I was quite happy with the robust array of features that the Hello Kitty karaoke system ships with. It’s much more than I was expecting from a simple kid’s setup, and the auxiliary connectivity, screen, and audio modulation settings really turn this karaoke machine into a polished, all-in-one unit. It’s extremely portable to boot – perfect for any kid 5+, which is the manufacturer’s recommendation. Some kid’s machines end up being too heavy or too unwieldy, but I’ve seen my 7 year old niece tear around the room while clutching Hello Kitty karaoke machine the whole time. I was much more impressed with the Hello Kitty karaoke machine than I thought I would be. I was actually a little sad to see it go when I packaged it up and gifted it to my niece! I must say though, she absolutely adores this little karaoke machine. All in all, I definitely recommend this system as the perfect gift for any kid who likes karaoke and singing. It entertains fantastically, and I expect my niece to get years of use out of it!